For $3,500, Could This 1998 Olds Silhouette Let You Throw Some Shade? I think we all agree that it’s bad form to buy someone else’s project car. Full stop. The consensus shifts however, when that someone else just happens to be you. Then I think we can all agree it’s full steam ahead. That just so happened to be the case with yesterday’s 1985 Jeep Grand Wagoneer. It came with the advisory that it required some TLC, and with a price that engendered an 86-percent Nice Price win. Someone’s going to have a lot of fun making that wagon their project. Car makers have always been interested in maximizing the value of the platforms they build. That has meant that both utilitarian and romper stomper editions often would coexist within the same model lines. Sometimes, the two incongruous varieties might just find themselves commingling. That was just the case when Oldsmobile built a pair of cars that melded what were arguably models at the top of their respective genres—wagons and muscle cars. The end result was the 1970 Vista Cruiser 442 with W-30 package. That matched a 370-bhp 455-cid V8 with a skylight-equipped stepped-roof and room for the whole family wagon body. Why Olds stopped at only two—and never officially offered the combo to the public—is a story for another time. Instead, we’re going to look at another Olds for the family, one that’s also been imbued with some big beefy balls. This 1998 Oldsmobile Silhouette is an example of the first wave of vehicles to supplant the traditional American station wagon. SUVs and crossovers would eventually add the bullet to the brain, Robocop style, but these people movers were really the first salvo across the bow that wagons were living on borrowed time. The thing of it is, while most of the major manufacturers’ minivans were based on mainstream sedan parts, very infrequently would we see the courtesy of an implied reach-around in the form of some sporting mechanicals. Oh sure, Chrysler gave the Dodge Caravan their turbo four which was entertaining for a while, but where are the SHO-powered Windstars, the 4DSC (2Sliding) Nissan Quests, or the supercharged Pontiac GTP-powered Olds Silhouettes of the world? Well, you can check that last one off your list because that’s just what we have right here. This generation of Silhouette used a platform that was shared with the Chevy Venture, Pontiac Trans/Sport, and which was notable for being one of the few cars built in America to be exported to Europe. There it was sold there as the Opel Sintra and in England as the Vauxhall of the same name. It also had a lot in common with GM’s other FWD platforms, so much so that an entire W-body drivetrain seems to have found a new home under this Silhouette’s bonnet with little muss or fuss. That’s a 3.8-litre V6 with an Eaton M90 twin-scroll blower on top. The combo imbued the L67 with 240-bhp and a satisfying whine when coaxed. That’s a far cry from its forefather 442’s 370, but remember this Silhouette’s pumping those ponies through the front wheels. The Olds Minivan also probably carves a couple hundred pounds off that 442. This one not only has the GTP mill and four-speed automatic transmission, but also a water to air intercooler and aftermarket intake to boost those ponies. There’s some other add-ons but seeing as you’re reading about a minivan, I’m guessing they’re immaterial to you. More likely you’re interested in things like seating capacity and available back window space for your stick family. That’s all here too, although the back seats are apparently not installed at present. The van looks to be in surprisingly decent shape, seeing as it’s an almost twenty-year old GM product and one that typically is destroyed by rugrat infestation even before its time is up. Instead you get okay-looking seats, a sticker-free dash, and bodywork that seems to have avoided many of the suburban land mines. No mileage is given for the van over all, but the seller notes that the engine switcheroo was done about 3K ago. 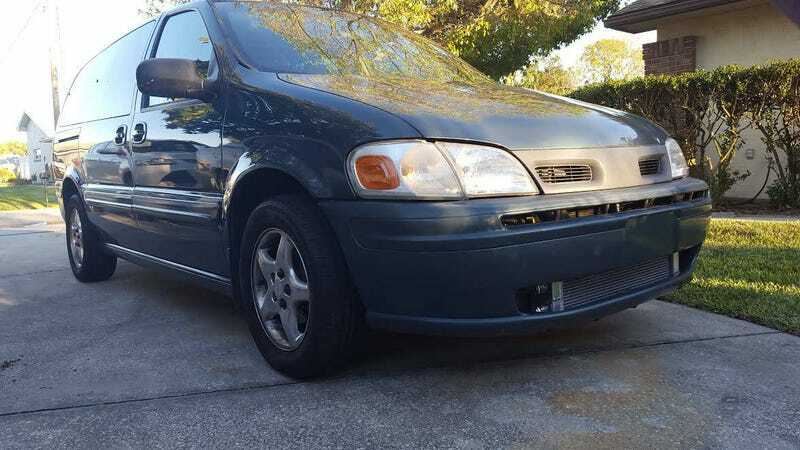 The price is $3,500 and unsurprisingly this mad max of a minivan lives in Florida. What do you think, is that a price that would make a trip to America’s wang worthwhile for someone seeking some pepitas in their people mover? Or, is this weird combo meal just too expensive for this soccer mom, or dad? Daytona, FL Craigslist, or go here if the ad disappears. H/T to Wes for the hookup!